This is one of the few podcasts where I listen to the episodes more than once. I trap my family in the car so that they listen to the deep and varied stories from across the south. It reminds me often of the depth of reporting I find in Texas Monthly. Should be called Liberal Gravy. Very preachy podcast in the episodes I listened to. Pushed diversity with food/cooking as a background topic. Can anyone recommend a podcast on Southern food and cooking where the passion and focus is Southern food and cooking? This used to be a great podcast. Not so much anymore. I used to look forward to the next drop of Gravy Podcast. (Pun intended). Now every episode seems to be not about food per se but about the downtrodden and quite frankly I donât care to listen to that. At least not every podcast. The last few months have been nothing I want to listen to. Just the take I was looking for. I came across this podcast in the past month or so, just before I move back to the South after four years spent in Chicago. I wanted something that explored some of the social and political and religious and cultural issues of the South, and how perfect that itâs centered around food, as food is one of the things I love most about the South. I also love that it is produced by Southerners, and isnât some effort by those outside to try and understand us, like weâre some sort of case study. Iâd recommend this to anyone! I especially like the episode about the women who duck hunt! It's really nice to hear a food show that's not about cooking or restaurants I'll probably never go to, but instead about bigger issues. It's basically This American Life that makes you hungry. I always learn something new... all by talking about food! Yum! Only flaw there arenât enough of them! But quality takes time. My family is from Appalachia, but I live up north now - this podcast makes me feel like I'm back in grandma's kitchen. It's the best. Stories from the South and how people eat come through in this great podcast. It's a great resource on culture and eating. Gravy is always informative, interesting and important. It serves up good, old Southern food traditions with a generous side of new offerings, thanks to a generation of immigrants. This is where history, poetry, stories, and food melt into one amazing podcast. 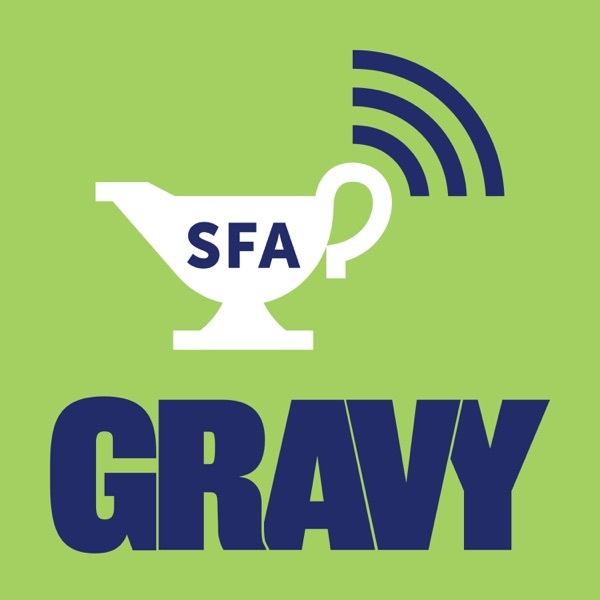 The Gravy podcast is the embodiment of my believe that wherever you go, you'll find the South. It offers a wonderful, insightful view into the way our food and our culture are not exclusionary, but all-encompassing. Well done, y'all. Beautifully produced, wonderful insights and excellent story telling. My actual favorite podcast out there. As a longtime, avid podcast listener, I have many, many favorites. Though not raised in the south myself, I have long had a love and appreciation for southern cuisine as perhaps the only truly unique American cuisine in existence and, as a devout lover of all things excellent food-wise and an adroit cook, the relevance of this work has not escaped me. When you add to the SFAâs work as a whole the extremely polished and sublimely southern vibe of the finished podcasts with a healthy dose of integrated cultures and social justice, you have a podcast that has soundly made it to the top of my most favorite 'casts out there. They also shine a valuable light on the loving, community focused, tolerant aspects of the south, which is much needed in these troubled times. Their work is invaluable to me and, Iâm certain, many others. I deeply appreciate their efforts. I adore this podcast. It is entertaining and well-produced, and really shows the diversity of the South and all the people who make their home there. I look forward to every episode of this podcast - it's a smart, refreshing look at food and culture (and so much more) in the modern south, and the intelligent look at the intricacies of southern regional culture makes me feel seen and understood as a liberal southerner in a modern world. I listen to a lot of podcasts and this is the best one of them all. As a child of immigrants who was born and raised in the urban South and went to college in the rural South, this podcast speaks to me. I meant to only listen to one episode this morning. Im four in now. My Granny, from Tennessee, passed when I was in high school and listening to the voices and sounds of the South are bringing her into my Arizona home. I'm also learning so much about a people and place that I have ties to but unfortunately not a lot of knowledge of. Also there's some food thrown in. There are some great episodes in here but it focuses a lot on highlighting different populations' contribution to southern food. A lot of it sounds like intellectual narcissism and is full of factual errors. Best food podcast to date. This is my favorite podcast and I listen to them all day long while working. It is honest, interesting, thought provoking and absolutely needed. The lessons you learn while listening are something none of us got in school and are vital to understanding the landscape of this country! I often recommend this poscast because it will grab you and take you deep into the South! Bravo! When a podcast leads you from oral histories of farm wives recalling the excitement of being able to make jello - along the way teaching you about the Rural Electrification Administration you know they are cooking with gas!I LOVE this podcast! Wonderful, insightful stories. Keep them coming! Great variety, intelligent conversation, responsible topics. Well worth the time and very entertaining. I learn, I feel more connected to the people around me and their quiet stories revealed through food, and often there are tears in my eyes by the end. The best! This is a lovely podcast; well constructed, the stories are delightful and thoughtful, and one of the best additions to my collection of podcasts. Narrators are very well spoken, it sounds highly professional, while being very down to earth with its material. Great stories. Always an interesing listen! This is an excellent podcast. The stories are varied, really interesting, and Tina's voice and narration delivery is spot on! Love, love , love what you guys are doing! Rich, intelligent storytelling about the South. Especially wowed by the Shirley Sherrod episode. Keep it up. Love this. So many interesting stories. Gives me great ideas for my classes on culture. Gravy is everything I have been looking for in a podcast...smart, thoughtful, refreshing & SOUTHERN. Always engaging and interesting. My most looked forward to podcast! I love podcasts with such a specific focus, and "the changing American South by way of food" is just such a great hook for a show. I love the multicultural aspect, helping correct my ignorant Yankee misconceptions about the diversity of the South. As a Southerner who lives in NYC now, this podcast offers a chance to spend a little time at home. In fact, the episode about the Mobile Bay Jubilees hit EXACTLY at home and I got to learn a lot about a tradition that I've actually grown up with! I truly love this podcast! Time for some honesty. As a California boy who has had a lifelong fear and, to some degree, distaste for the South and the cultural traditions that came to me in school books, I approached this podcase with some trepidation. But my love of regional American food drew me in. This podcase offers so much more than food, however. I am beginning to understand Southern ways more than ever before. The journalism carried in the epidsodes of this podcast is a marvel, and Tina Antolini is a great host. Couple listening to these and combine it with the website The Bitter Southerner, and you will see many sides to the South that you haven't before. I hope to be adopted by a Southerner soon. Bravo, Gravy! A fried chicken liver, crunchy giving way to creamy ... a mess of turnip greens flecked with ham hock and doused with red pepper vinegar ... a sky-high meringue over a coconut cream ... a bottom-shelf bourbon ... and so much more about the South and Southerners and Southernness. It's perfect. While I appreciate the commentary on Southern culture and Southern food, there seems an attempt to shame Southerners for their history as well as an overt attempt to replace Southern culture with another culture that someone else thinks is more suitable. Specifically, I will cite the "The New Old Country Store, Ep. 36" commentary about Cracker Barrel. The individual's perspective is more subjective commentary than objective historical commentary. The individual comes across with a moral superiority that is totally not Southern. Where's the humility that characterizes the South and the truly Southern people, of all races and genders? It's not in that particular commentary. I'm sure liberal Southerners and academia will praise her commentary to high heaven, but how is she any different than any other "outsider" journalist or photographer who came in and portrayed the South as a backwards, racist, ignorant mass of people? At our local Cracker Barrel, ironically you'll find more blacks than whites dining and enjoying the food. I wonder what she would think of that and how she would explain it with regards to food culture? Thank you! This podcast is exactly what I needed. I love this podcast. So well made and interesting. As a northerner I still find it incredibly interesting.